Even though this isn’t my regular day to post, I wanted to let you all know about an opportunity. 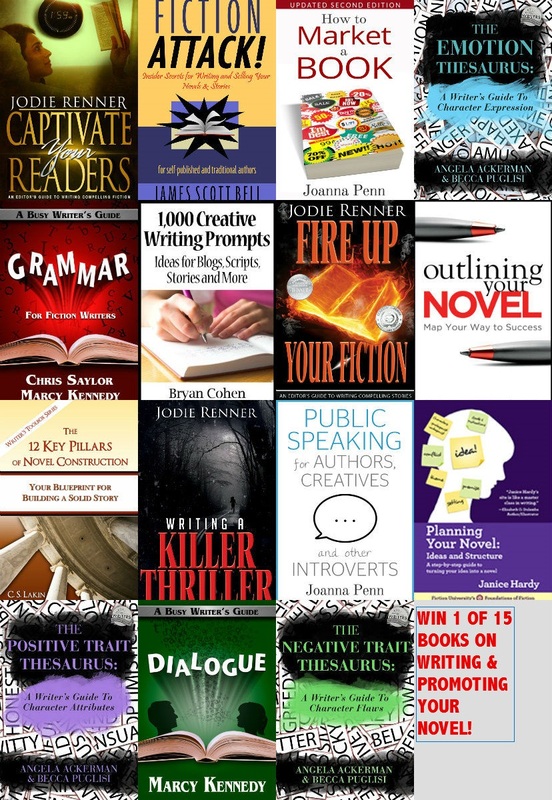 From February 14th to February 28th, you can enter to win one of 15 excellent ebooks about writing and marketing your fiction, including two of my Busy Writer’s Guides. Take a look at what’s on offer! ~ The Negative Trait Thesaurus, by Angela Ackerman and Becca Puglisi. To find out how to enter, you’ll need to visit the site of the talented Jodie Renner. 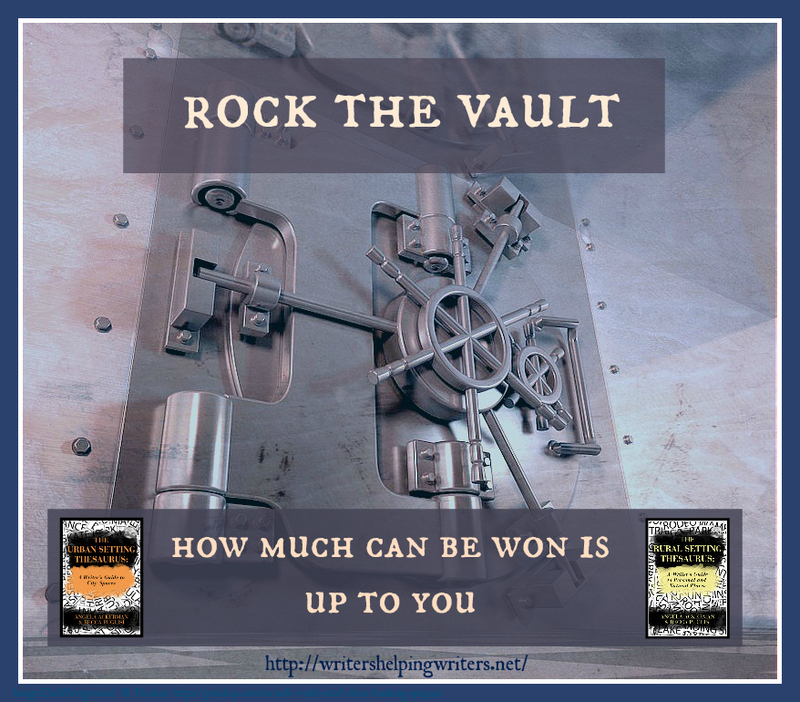 She put this fun event together to celebrate the release of her newest book Captivate Your Readers . Winners will be drawn on March 1st. Interested in more ways to improve your writing? You might also want to check out Showing and Telling in Fiction . As writers, our job is to create a meaningful emotional experience for readers. One of the best ways to do this is to convey the quality and depth of our characters’ feelings through their thoughts, body language, and visceral reactions. This is the primary focus of The Emotion Thesaurus: A Writer’s Guide to Character Expression and is at the root of the “show don’t tell” principle. Writers are just like every other profession in one important way—the right tools make our job easier. The Emotion Thesaurus is one of those tools. When we’re writing, it’s easy to fall into certain standbys without even realizing it. He’s angry—he frowns. She’s frustrated—she sighs. But those unimaginative responses don’t begin to do credit to the variety of non-verbal communication we use every day or to the unique, three-dimensional characters we’re supposed to create. That’s where The Emotion Thesaurus comes in. Today I wanted to give you the three ways I think The Emotion Thesaurus can help you write better stories. Because I want to find fresh ways to express emotions in my writing, I often spend a lot of time, especially at the editing stage, looking up emotions online and studying non-verbal communication. Even as someone who has a degree in Social Psychology and loves digging into what makes people tick, I don’t enjoy how much time this eats up and I’m tempted to skip it. The Emotion Thesaurus brings the research you need together in one place. Each entry defines the emotion and gives physical signals, internal sensations, mental responses, signs of that emotion over the long-term, and cues that the emotion is being repressed. What that allows us to do is figure out what emotion our character is feeling and look through the lists to find expressions that fit our character and the situation they’re in. Then we can personalize it. For example, one of the internal sensations for agitation is feeling overheated. How will your character describe that sensation? A middle-aged woman with a good sense of humor might think of it in terms of getting a taste of the hot flashes she’ll experience in menopause. A teenager might liken it to when the air conditioning broke in their house for three whole days. A character with money might describe it as similar to how he felt when he stayed in the sauna too long. Same sensation. Different points of view. Infinite possibilities. As you read through the list of characteristics for the emotion you want to convey, you’ll notice some symptoms of that emotion are perfect for increasing tension. You can use agitation to lay the groundwork for bad things to come or to make the current scene more stressful. Many emotions, even positive ones, can have these undesirable consequences. Becca and Angela also include a “Writer’s Tip” at the end of each emotion with a special hint for other ways you can use that particular emotion to add tension or some other depth to your story. One of the tricks Blake Snyder shares in Save the Cat is that in every scene the character needs to end at a different emotional place from where they began. I struggle with this because I tend to be hyper-logical and tamp down on my emotions. I’m not always certain of the progression an emotion might take in someone who’s less like a Borg. Becca and Angela added a “May Escalate To” list for each emotion. So, for example, if your character starts the scene agitated (or becomes agitated early on in the scene), you can look at the list and see that likely emotional outcomes by the end of the scene or in the following scene are annoyance, frustration, anxiety, or anger. Then you can go look at the physical signs of those emotions. In helps us bring our character to that next step. Another thing mentioned by Becca and Angela in their front matter (which is a great look at emotion in itself) is that we often need to seek the root emotion to bring out the correct signs. A person might believe they’re angry, but that anger might actually be a cover-up for something else. So while your character might be screaming at their teenager for wreaking the car, they’re also grabbing their child into a hug because the true emotion isn’t anger—it’s fear and relief that their child survived. For places where you can buy The Emotion Thesaurus and a lot of great free resources, make sure you check out Becca and Angela’s site The Bookshelf Muse. What’s your biggest struggle when writing character emotions? Have you checked out The Emotion Thesaurus? I’d love to have you enter your email address below so you’ll receive an email update next time I post.